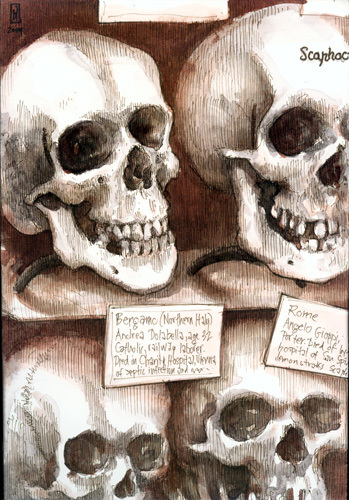 In 1874, the Mütter Museum acquired more than 100 skulls from the collection of Austrian anatomist and phrenology debunker Joseph Hyrtl (1810-1894). Hyrtl amasses this collection for studies in comparative anatomy. Most of the skulls bear an inscription with the original occupant's name, age, location, trade, religion, and cause of death. In this drawing, the main skull featured is that of Andrea Dolabella, a 32-year-old railway laborer from Bergamo in northern Italy. Beside him is the skull of Angelo Gioppi, a porter and former resident of Rome.